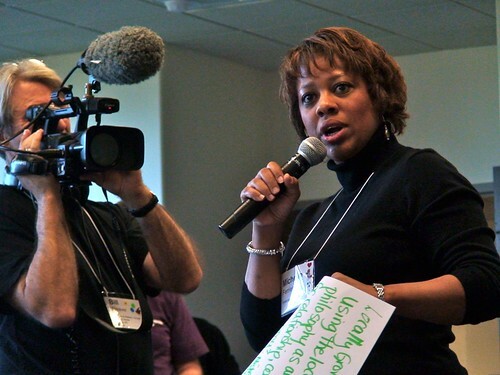 A diverse group of more than 200 journalists, entrepreneurs, techies, nonprofit organizers, artists, activists and others gathered last week at UW with the grand mission of re-imagining the news ecology of the Pacific Northwest. This Journalism That Matters “unconference” focused on journalism’s relationship with the community. I was delighted and relieved that this was not a pity party about the good old days of journalism. The participants were open to change and were there to figure out the future, not to pine for the past. Sure, when you get dozens of laid-off people in a room, there are going to be some depressing chats about filing for unemployment, but overall, the mood was amazingly optimistic and upbeat. “The snark level is very low,” remarked one woman. For me, the biggest benefit was meeting people who are involved in a variety of interesting startups and experiments. I learned about Xconomy, a news site that covers tech industries in three cities, and TheNewHive.com, an innovative social networking site set to launch by the summer. I learned about InvestigateWest’s business model and the need for a better online system to share content among community radio stations. Passion. “At this time of transformation, we all need to connect with our feelings and care, and put that caring into our work,” artist Chris Jordan told the audience during an opening night speech. “… It’s time to take the templates off and speak authentic human being to authentic human being.” This idea of showing passion in our work – and showing love for the communities we cover – came up repeatedly. Community. We quickly learned that generations define communities differently. For younger people, our communities are online, not necessarily based on geography. Collaboration. On Saturday, I tweeted that the word of the day was “collaboratory.” By Sunday, a group was working on plans for a JTMPNW collaboratory, a learning lab for entrepreneurial projects and nourishing connections, and tying the idea to the creation of a civic commons. Engagement. Journalists need to stop talking to their audience and instead engage in a conversation with them. Media literacy. In an information-packed world in which everyone is a journalist, the public needs better training about evaluating news sources and information for accuracy and credibility. Hyperlocal. Several discussions focused on the need for collaboration between hyperlocal neighborhood bloggers and mass media. On the final day, a large group worked on building a roadmap for mass media and hyperlocal journalists to work together and find financial sustainability. Government coverage. Many participants were concerned about the effect that cutbacks at traditional media outlets have had on state and local government coverage. But we also learned about new projects to solve this problem. One attendee, Trevor Griffey, is starting a nonprofit site called Olympia Newswire to cover this year’s legislative session and revitalize statehouse reporting. Business models. Creating new business models was, of course, a big part of the conversation. “It doesn’t have to be one model. It can be lots of small revenue streams,” I overheard someone say. Those revenue streams include memberships, foundations, grants, advertising, holding events, subscriptions and so on. Although business models were always part of the discussion, I would have liked to see more concrete sessions about funding. For future conferences, I’d suggest bringing in more people from the business, advertising and tech startup sectors to provide expertise on new business models. Along those lines, I would have also liked to see presentations by journalistic startups that are succeeding and growing. Maybe you can’t create a new business model for journalism in four days, but you can create the germ of an idea and get the ball rolling. During a period of group reflection, one of the organizers, Peggy Holman, shared her fear that once we have we have the business model figured out, innovation and experimentation will stop. I worry that she’s right. So we when we do figure out the business models (and there will be several), we must keep innovating. Complacency and resistance to change are part of what got the news business into this mess. I’m excited to watch and participate in the projects that will come out of this “unconference.” Past JTM events have played a role in formulating innovative ideas, such as the Common Language Project, a nonprofit investigative journalism organization now based at UW. If there’s one thing we all learned, it’s that the opportunities for collaboration and experimentation are endless in our new news ecology. JTM did a great job using social media and aggregating that information. You can read notes from the various sessions on the JTM wiki, catch up on the tweets, view photos and watch videos. If you’re interested in joining this conversation and attending future events, join the LinkedIn group. Amy Rainey is an MCDM student, digital journalist and online storyteller. Visit her Web site or follow her on Twitter. Image Credits: Photo courtesy of Harold Shinsato. Amy, great summary of JTM. As you say, there was a lot going on at once and we couldn’t be everywhere, but I wish you’d been in our business model conversations. We discussed how freemium could apply to a news site. Getting down to business, we generated a list of features (software “features” not journalism “features” i.e. not stories, not content) for which readers and contributors might be willing to pay and discussed the pricing and audience that could make a journalism venture sustainable. I come from the software and tech startup sector; there need to be many more meetings of software and journalism minds, but this was a good one. Thanks, Brian. I wish I had been at that session too, though I learned a lot from the sessions I did attend. I’m looking forward to reading the notes and hopefully attending future events that pair up software and journalism minds. It’s very interesting point of view about business model identification, Amy. But it seems that social media and new innovations make the process of identification of proper business and monetization model more complicated. It means that there are a lot of nuances that every media should now consider to get own stake of pie. Recent trends may witness about desintegration of markets in relations to the economy of scale effect. The leaders of media industry moving to a periphery of our vision, and diversity of new tools and sources of information is creates the atmosphere of florid carnival behavior. During carnivals consumers generally spend money just to be engaged in a process and do not expect to gain any profit. They seek gratification. Can gratification be the product that media provide or they still sell information? This is awesome. Opptimism goes a long way and you have to take the good with the bad. I like the key points touched on above. Journalists definately have to interact with their audience and they definately have to have a passion. Anyone can write but it’s the passion that brings the writing to life and makes it interesting. I think that the future of journalism is hard to tell but this website is pretty helpful in answering questions about it. Crowdfunding for Journalism. Alms for the Press? Expansion of ‘Stock Photography Business’ to ‘Visual Content Industry’ Five Ways to Establish Credibility as a Blogger KCTS Partners With InvestigateWest Niche apps: A future for newspapers?